Previous home extensions and other residential development schemes - photo gallery. Here are just a sample of some previous projects completed by CHP. Single storey rear extension - 2007. Existing property:- Semi detached Victorian dwelling. 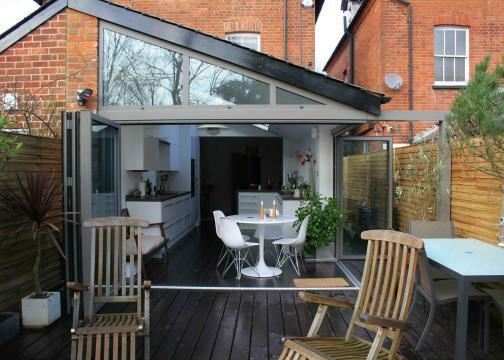 Clients requirements:- To remove the existing inadequate rear extension and erect a new larger extension to form an open vaulted kitchen and dining area with contemporary design features for roof glazing and a frameless glazed corner. CHP comments - scheme very much client lead with a good firm brief of requirements. Many technical challenges for cantilever support of glazed door corner and uneven boundary wall to be retained. Office block to residential dwelling conversion - 2009. Existing property:- Two storey office block in Marlow conservation area. Objective:- To convert the existing office building from office use to 2 No. dwelling apartments. CHP comments - No new building volume proposed only internal alterations. Many technical challenges relating to thermal compliance and party floor sound insulation. Replacement dwelling chalet bungalow Marlow. Clients requirements:- Initially approval obtained to extend the existing property but after inspection and opening up the existing property was too bad for reuse so another scheme was proposed for complete demolition and replacement to a similar design of the extension scheme. CHP comments - Hard to determine practicality of extending versus costs of complete rebuilding when a property is extended to a high degree during design build up. Saving of VAT is often the motivator. It is a fine line. Replacement dwelling house Gerrards Cross Bucks. Clients requirements:- To use the site simply as a plot in this much sort after area. To remove the existing outdated dwelling and erect a substantial quality property incorporating a basement & rooms in roof (four floors in total). Client very open to design ideas and suggestions. Site had important trees that could have affected size and siting of property so pre-emptive report and guidance taken from Tree Specialists. Client went with the original design proposal and the scheme received formal Planning Approval at the first attempt. CHP comments - Apart from existing mature trees, very few planning issues arose. Generally well supported by neighbours. Hard to determine where the 'over-development' threshold is for schemes like this - can be very subjective. Top quality spec dwelling produced. 2 for 1 replacement dwellings - redevelopment of site. Clients requirements:- To maximise development potential on the site. CHP comments - scheme went through 3 design proposals before being acceptable to Planning Dept. Planners were resistant to garages being located under main dwellings as part of a basement design that would have created more space. Large bungalow extension. 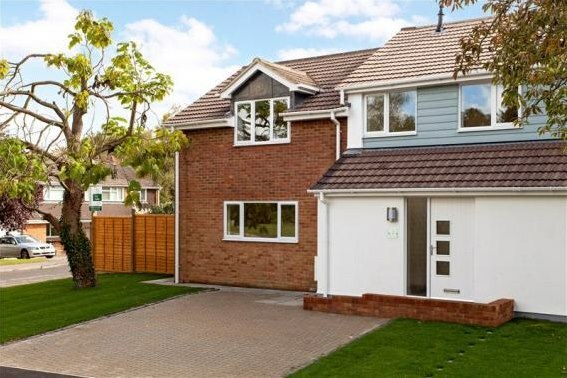 Clients requirements:- To extend the property for maximum development to provide spacious living accommodation with internal annexe for relatives. CHP comments - Not much left of original dwelling but still more economical than complete knock down & rebuilding. Large bungalow extension. Clients requirements:- To remove the existing inadequate hipped roof & install a new steeper pitched roof with dormer windows for conversion into habitable bedrooms and bathrooms. To extend at the rear to form a large family kitchen and eating area. CHP comments - Difficulty with Planning Dept. over dormer design who were resistant to linked pitched roof dormer windows. Large bungalow extension. Clients requirements:- To remove the existing inadequate rear extension & erect a new larger extension to form an open vaulted kitchen and dining area with contemporary design features for roof glazing and a frameless glazed corner. CHP comments - Increase of ridge height would be resisted by the Planning Dept. due to similar size properties either side of the site. Crowned roof design solution offered to maximise first floor space. Large house extension. Clients requirements:- To extend the existing property for maximum development on the site to form a large family dwelling house. To remove the existing flat roof of previous side extension and replace with a pitched roof. To incorporate thermal improvements and use of materials, fittings etc. for a low carbon dwelling. CHP comments - scheme very much client lead with a good firm brief of requirements. Many technical challenges along the way. Semi-detached house extension. Clients requirements:- To extend the existing property that was entirely original to form an extended dwelling house of reasonable size for a young family to a budget cost. This was not maximum development for the site. 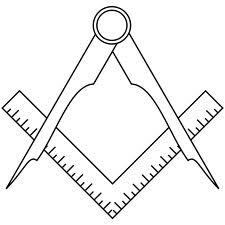 To refurbish the existing structures inside & out. To retain cottage feel to the extended property. CHP comments - I was given a free hand to propose what I thought was required based upon the clients brief. As the property was a semi-detached house where the adjoining property had already been extended & refurbished, we took our design lead from that neighbour to maintain an overall balance to the properties. Large house extension within the green belt using permitted development rights. Clients requirements:- To extend the existing property by as much as possible to form a two storey large family dwelling, maximising views across the open countryside, to improve its external appearance and character and to provide a totally refurbished modern home appropriate for the generous plot size and wonderful location all within the constraints of the Green Belt. CHP comments - I was given a free hand to propose a set of works and extensions that was very much reliant upon exploiting the recent changes to the Permitted Development rules if we were to achieve the final size of the completed dwelling. Replacement double garage. 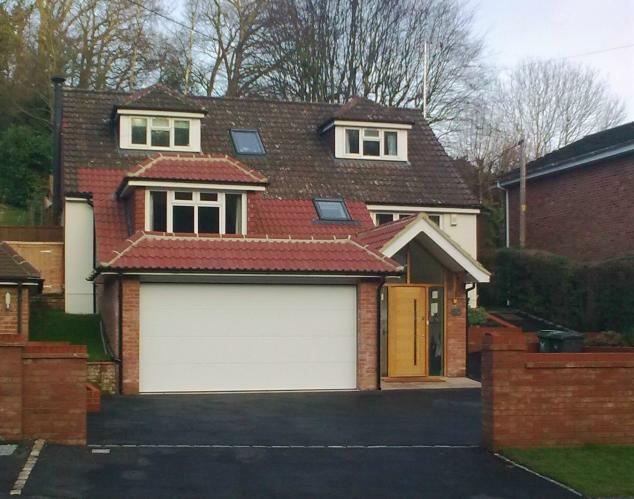 Clients requirements:- To replace the existing garage with a more characterful detached garage using appropriate sympathetic design and external materials. CHP comments - I was given a free hand to propose a scheme design that would be supported by the Planning Dept. As the garage was forward of the principal elevation it could not be constructed under the sites permitted development allowances. To remove the existing bungalow on a large site within the green belt and to erect a pair of semi-detached houses. Clients requirements:- To maximise development potential on the site. CHP comments - scheme went through 2 design proposals before being acceptable to the Planning Dept. Planners accepted that infill development was acceptable within the Green belt provided the site was within a recognised settlement within the green belt where limited 'infilling' is acceptable subject to design. Very contentious route through planning due to neighbours and administration errors by the Council. To extend the existing dwelling at the rear for a large family kitchen and eating area & additional bedroom space over. Clients requirements:- To extend the existing property for a larger sem-open plan ground floor living space and additional bedrooms over. To remove the existing inefficient conservatory. 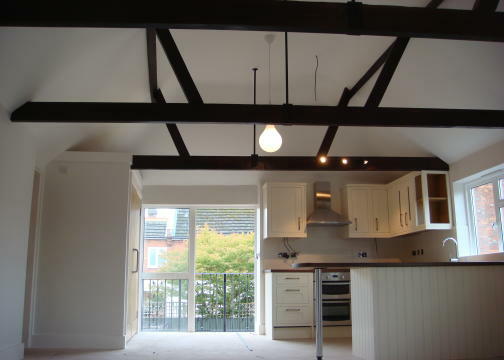 To incorporate internal alterations & remodelling of both floors for better use of space. CHP comments - scheme very much client lead with a good firm brief of requirements. Many technical challenges along the way regarding structural support to the existing property for the hollow clay pot wall construction and the mansard roof design. Nice to use more standard external door arrangements rather than the usual (now very common) bi-folds for a change. 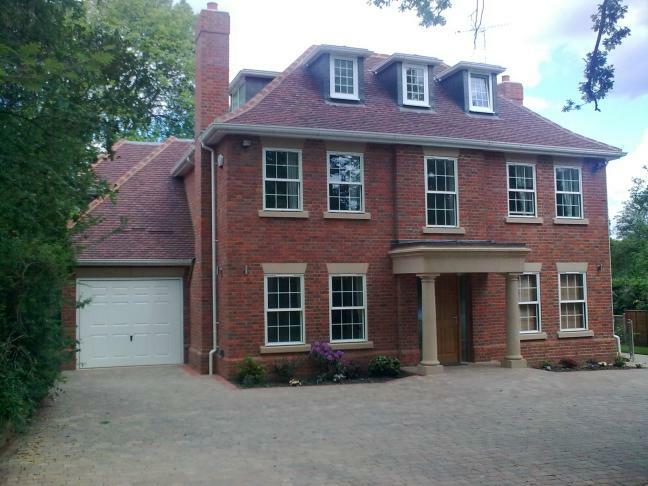 Large house remodelling with extensions and a new roof for a modern contemporary home. Clients requirements:- To extend the existing property by as much as possible (and allowable under Planning) to form a two storey large family dwelling with contemporary features & styling, to improve its external appearance and character and to provide a totally refurbished modern home appropriate for the generous plot size and great town centre location. CHP comments - CHP was given a free hand to propose a set of works and extensions that was very much reliant upon exploiting the sites potential but partly constrained by its immediate neighbours. Pub to dwelling house conversion - To structurally alter an existing detached pub building within an important village setting and to seek planning permission to turn it into a substantial single dwelling house for residential use through the Planning system. Pub to dwelling house conversion - A two storey historic stone pub building in Oxfordshire within a central village location. The site benefited from a large side car park that could also accommodate a single dwelling house as acceptable infilling. New dwelling house within pub car park - To construct a new four bedroom dwelling house within the car park of an Oxfordshire village pub that was now surplus to requirements due to the change of use of the former pub back to a residential dwelling house. Swimming pool buildings - For around 30 years now Christopher Hunt has been assisting one of the largest and best known specialist swimming pool constructors in the UK. 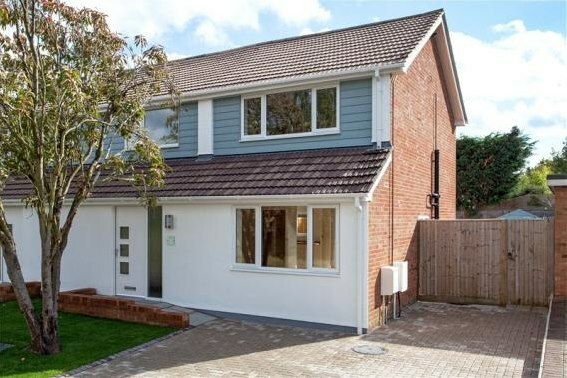 Even tired classic 1970's and 1980's estate homes can get the Chris Hunt Design treatment and a great new lease of life by transforming it into a modern contemporary style of home with clever use of home extensions and new internal layouts. Completed May 2013. A tired undeveloped classic 1950's detached estate property can get the Chris Hunt Design treatment and a great new lease of life by transforming it into a modern contemporary style of home with clever use of home extensions, new internal layouts and a re-rendering of the external walls. Completed May 2014. A tired 1960's Marlow Bottom Bungalow with an appalling street scene frontage due to the dilapidated garage leaking water and falling apart. Poor front entrance provision and no external landscaping or formal off road car parking arrangements. Property development in Henley on Thames where a large detached house was extended and sub divided into two semi detached dwelling houses. How to triple a house size within the green belt. This is an example of what can be achieved by using CHP as your expert guide. We have completed around 5 of these types of developments for our clients. Why not sign up for our 'Property Developer Master Class' for a 'one to one' tuition session of just how to do this. Property selection is vital. Without knowing what to look for you will be lost. 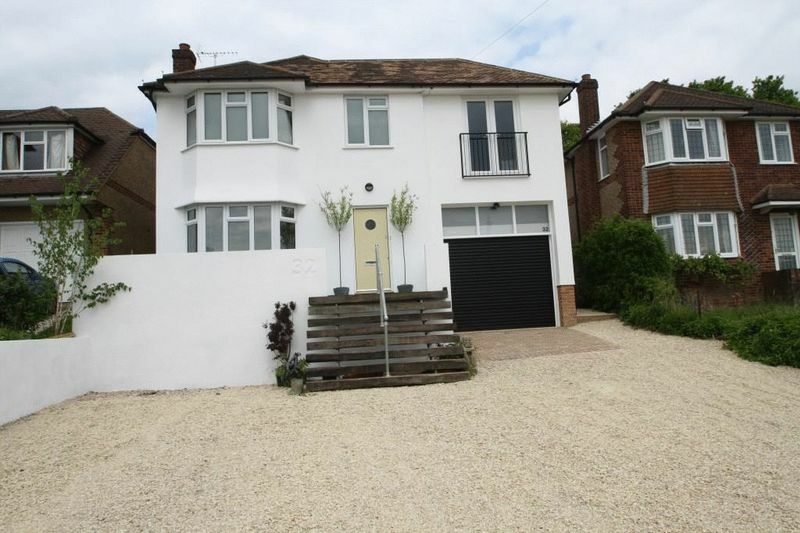 Triple garage with room over in Marlow Bucks.